A four day 'India International Science Festival,' organised by the Union Ministry of Science and Technology, will begin here on October 13, Union Science Minister Harsh Vardhan said here today. Chennai: A four day 'India International Science Festival,' organised by the Union Ministry of Science and Technology, will begin here on October 13, Union Science Minister Harsh Vardhan said here today. The fest, to be held in multiple venues, including Anna University, Central Leather Research Institute (CSIR-CLR) here will feature a series of events, he said. Stating that the response to the fest was overwhelming, he said after the science festival, there "should be good quality scientific temper and passion." On the progress made by premier research institution CSIR (Council for Scientific and Industrial Research), he said the institution which last year was at the 12th position among about 1,200 government funded research institutions worldwide, had moved up to ninth rank as per the Scimago Institutions ranking World Report 2017. Similarly,in global ranking for private and public funded institutions, CSIR which held the 99th position, had improved to 75th rank among about 5200 institutions across the world. Besides Anna varisty and CSIR-CLRI, events will be held at Structural Engineeering Research Centre (CSIR-SERC), National Institute of Ocean Technology and IIT-Madras, he added. A meeting of Science and Technology Ministers will be held on the inaugral day of the festival at IIT Madras here. 'Science village,' a programme intended to give exposure to students from rural areas on the country's achievements in science and technology, a summit on innovative technologies from several States, a conclave of women scientists and entrepreneurs, an industry academia interaction are among the events that have been lined up for the science festival. 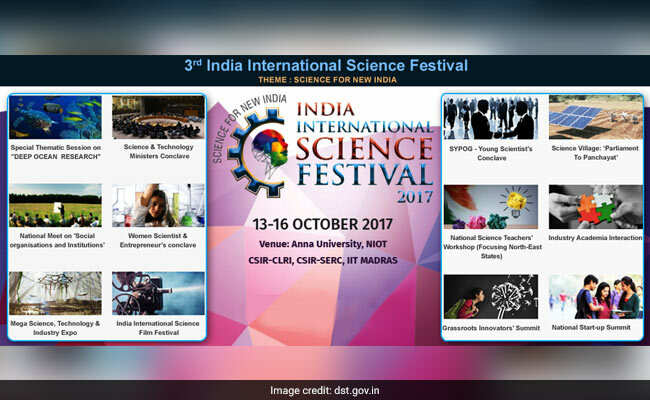 Union Ministries of Science and Technology, Earth Sciences and Vijnana Bharati together have been organising the India International Sciecne Festival since 2015. The initiative is to encourage scientific temper among the people and showcase Indian contributions in science and technology.